On the timeless Village Green of Ilmington, nestled beneath the Cotswold Escarpment, lies The Howard Arms, a stunning, 400-year-old Cotswold-stone inn. While repainting we took down a huge black board. Look what we found! On the back, sad and faded, was this sign. We’ve restored it. 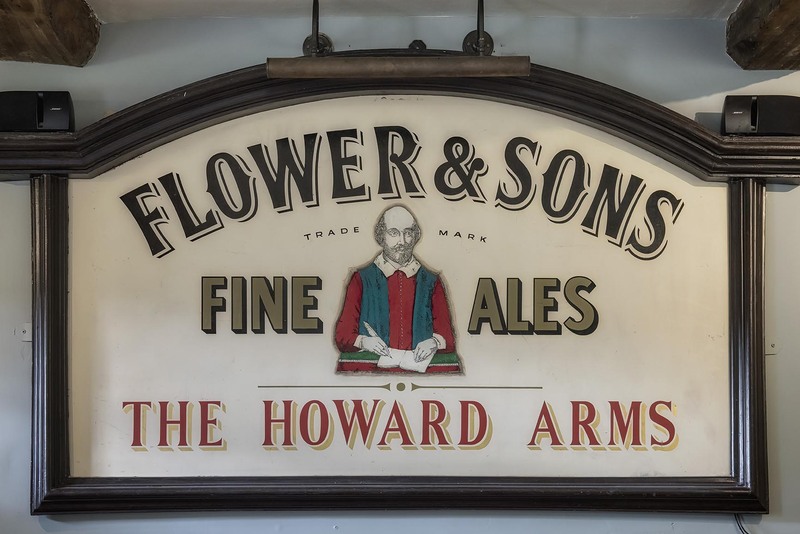 Flowers Brewery was founded in 1831 by Edward Fordham Flower in Stratford-upon-Avon. His son, Charles, was the founder of the original Shakespeare Theatre in 1875. Relatives of the Flower family still live in Ilmington Manor. The Lordship of Ilmington Manor “resides” with Lord Howard of Corby after whom the Howard Arms was named. The pub and dining room have been refurbished to combine an appealing mix of old furniture, broad polished flagstones and a log fire that burns for most of the year. It is an especially attractive and relaxed place to drink and eat, with dogs welcome to join their owners in the bar area. Particular attention was given to the lighting. Local company Lightmasters came up with stunning and original designs, some of which even incorporate soundproofing. The Howard Arms is well-known for the quality of its menus, locally sourced food, home-baked bread, Sunday roasts, amazing puddings, choice of real ales and discerningly chosen wines. There are also eight beautiful bedrooms, some new, some old, some very large. Luxury, comfort and attention to detail are the focus of the bedrooms. 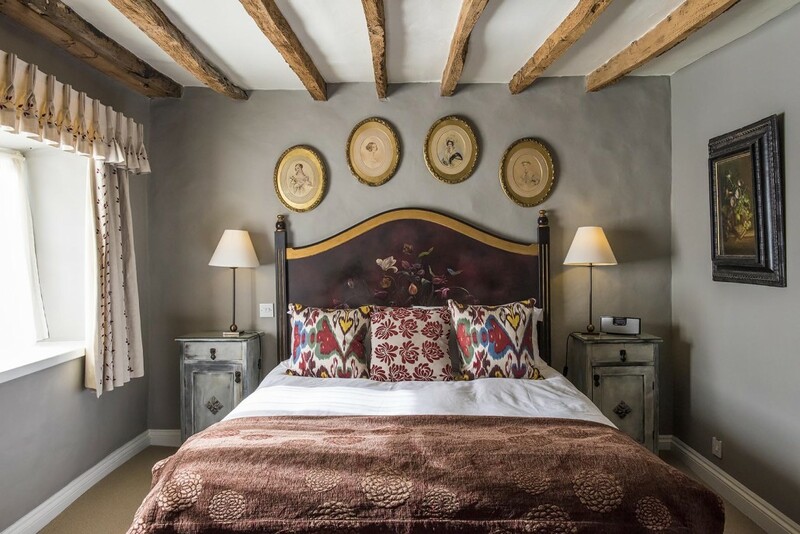 Each offers en-suite bathrooms, large beds with hand-stitched and sprung mattresses, attractive fabrics and a clever mix of antique and modern furnishings to ensure that every room offers its own individual personality. The Howard Arms is sited away from main roads or street lights so a good night’s sleep will leave you revitalised and refreshed, ready to enjoy our wholesome three-course breakfast. The Howard Arms is easy to find in the centre of the village and provides ample off-street parking. 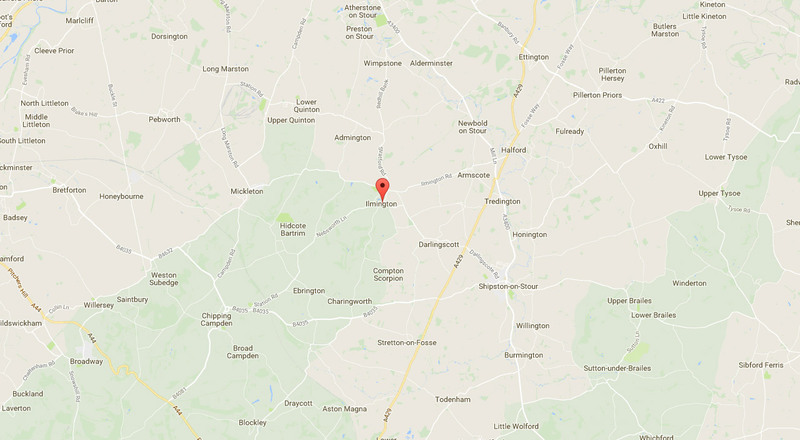 Driving from the North follow the M40 to junction 15, A46 to Stratford-upon-Avon, A3400 towards Shipston-on-Stour and Oxford for 4 miles then take right turn, sign-posted Wimpstone and Ilmington. From Oxford follow A44 to Chipping Norton, which becomes A3400. Turn left in Shipston-on-Stour past Sheldon’s Wine Merchants and 2nd right into Darlingscott Road, crossing over A429, through Darlingscott and on to Ilmington. The Howard Arms has parking for guests with disabilities near the entrance. There is level access leading into the bar and bar eating area. There is one downstairs bedroom. Non-allergenic bedding is available. Bedrooms are available without fitted carpets. Meals for guests with special dietary requirements can be provided.